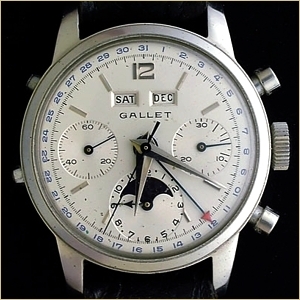 One of the most finely engineered, complex, and rare timepieces of the 20th century, the Gallet MultiChron Astronomic chronograph gave the wearer the ability to accurately record events lasting over 12 hours in duration as well as at-a-glance display of the current day, date, month, and phase of the moon. 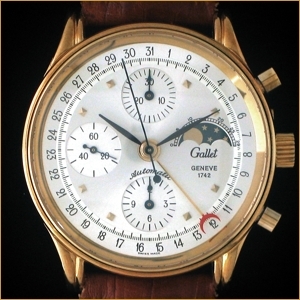 Due to the watch's original high selling cost, only a small handfull were ever produced causing the Astronomic to be one of the rarest of all 20th century chronographs. 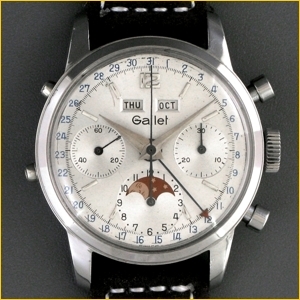 Model name: MultiChron Astronomic "waterproof"
Model name: MultiChron Astronomic "250th Anniversary"